There are thirty-seven Gorgon Eye chests in all. However, eighteen is the maximum amount of Gorgon Eyes that can be collected. 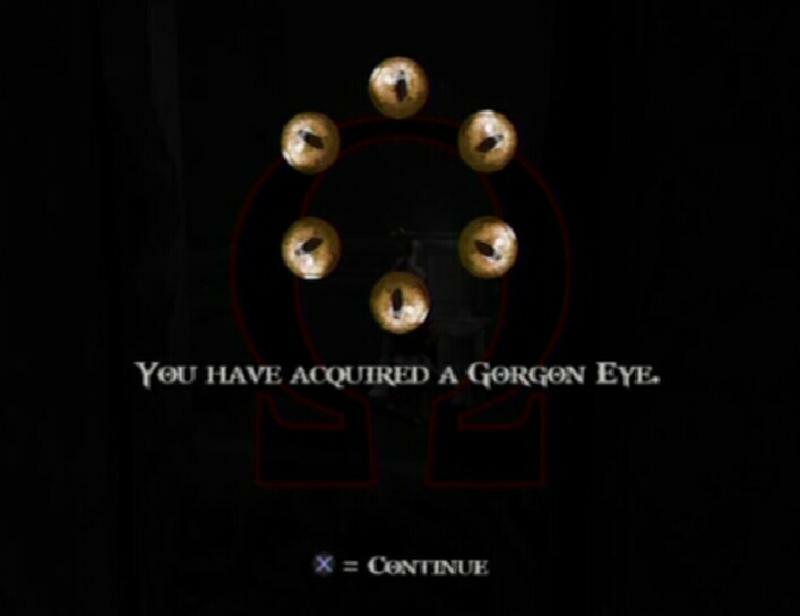 Once eighteen of the eyes have been found, all of the remaining Gorgon Eye chests will change to Red Orb chests. When opened, these chests release a large amount of Red Orbs, so it isn't a total waste of time to seek them out. 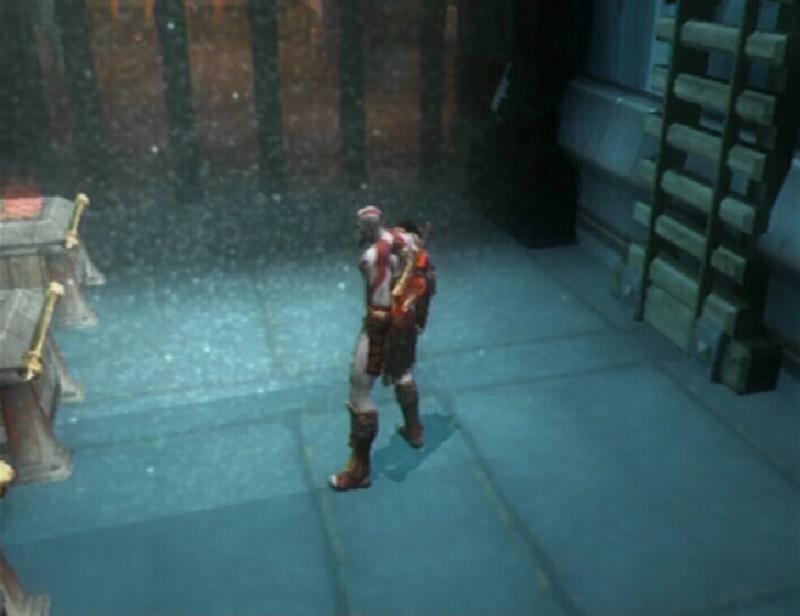 Gorgon Eye chests can be found in various locations throughout God of War II. Certain unmarked chests contain these items. 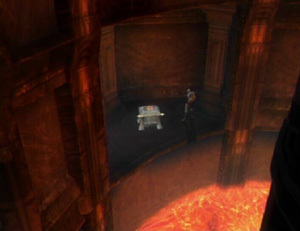 These chests are usually placed in an inconspicuous location, but not always. The health meter will increase with every six Gorgon Eyes found. GORGON EYE (1/37): This chest is found inside the Colossus of Rhodes. 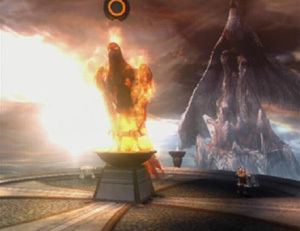 After destroying the third power core, you are shown a rope. If you climb this rope to the top, it will break, preventing you from obtaining the Gorgon Eye. Before you climb up that rope, while standing on the lower portion of the walkway, turn left and climb up the rope wall. 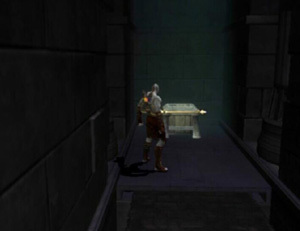 An unmarked chest containing the first Gorgon Eye sits on the platform. GORGON EYE (2/37): Inside the Hand Cavern, when Pegasus becomes pinned by Typhon, start climbing down the wall across from the Green Orb chest. 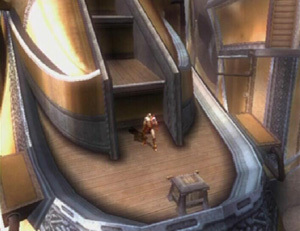 Once you are on the wooden walkway, turn left and drop down to the area with two chests. The Gorgon Eye is inside of the unmarked chest. 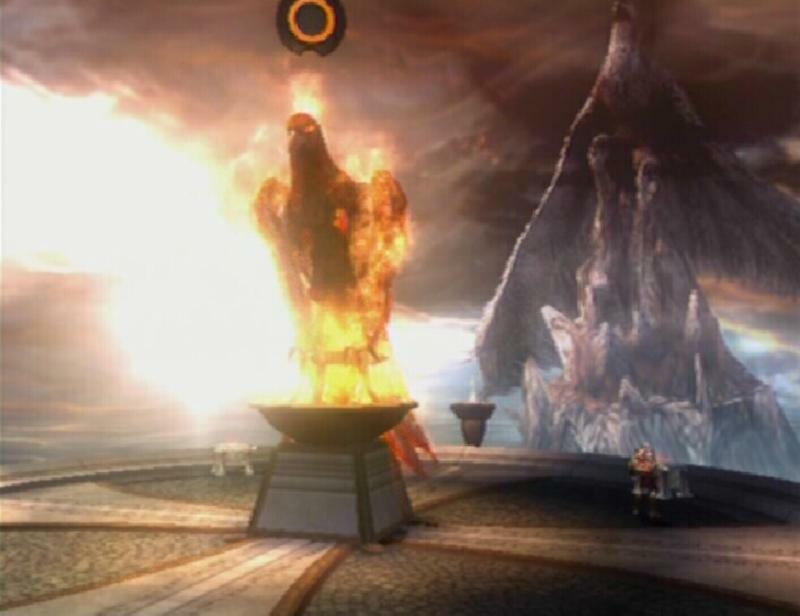 GORGON EYE (3/37): From the 'The Fire of Olympus' save altar, head right until you reach a climbable wall. 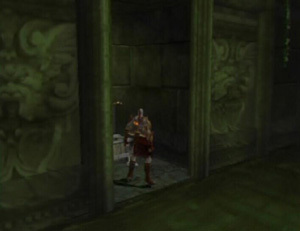 An unmarked chest containing the third Gorgon Eye is tucked into the dark corner on the right side of that wall. GORGON EYE (4/37): Once you have acquired Typhon's Bane and have exited Typhon's Cavern, slide down the wall and turn towards the broken bridge. Use Typhon's Bane to destroy the cage surrounding the grapple point. Use the grapple point to swing to the platform. The unmarked chest on this platform contains the Gorgon Eye. 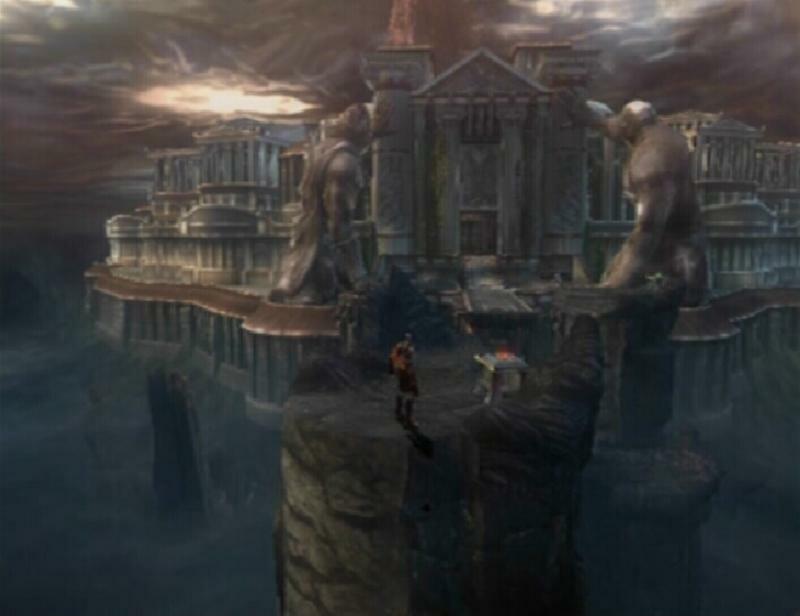 GORGON EYE (5/37): After freeing Prometheus from his torment, move to the end of the mountain side and jump up onto the ledge. 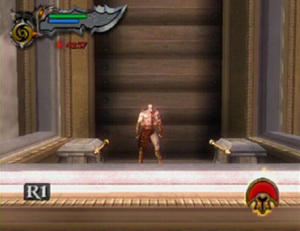 At the top of the second ledge, use Typhon's Bane to hit the piece of wood which lowers a rope. Climb up this rope. Once you are up the rope, turn right and jump up the ledges. Move left to the end of the platform towards the broken bridge. There is a hanging chain next to this bridge, grab hold of it and slide down to its end. Jump over into the opening in the mountain side and follow the path to three chests. The Gorgon Eye can be found in the unmarked chest in the middle. 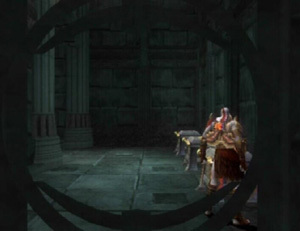 GORGON EYE (6/37): After using the corpse to open the two gates, and following the cutscene that is activated once you move to the end of the bridge, head back across the bridge and follow the path on the right. 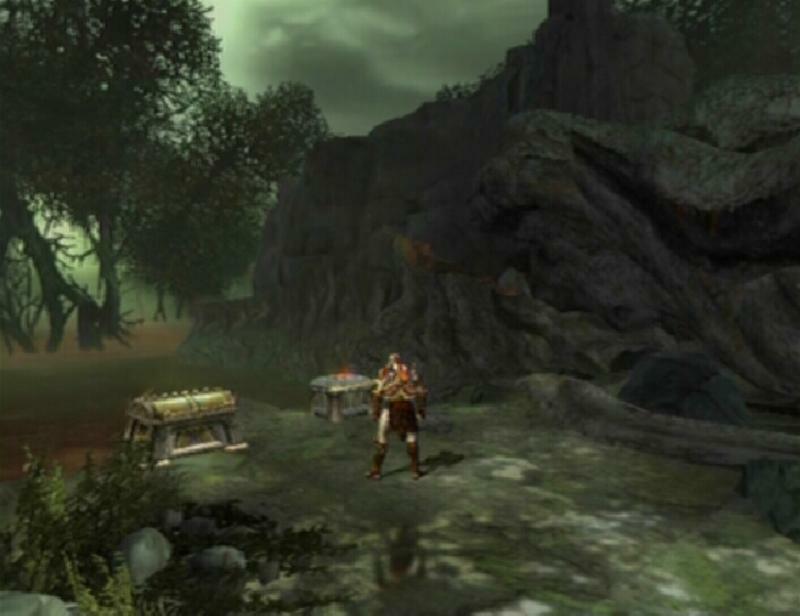 An unmarked chest containing the Gorgon Eye is at the end of this path. GORGON EYE (7/37): This chest is found in the room with the giant chain where you must kill the Sirens to break a rock barrier. 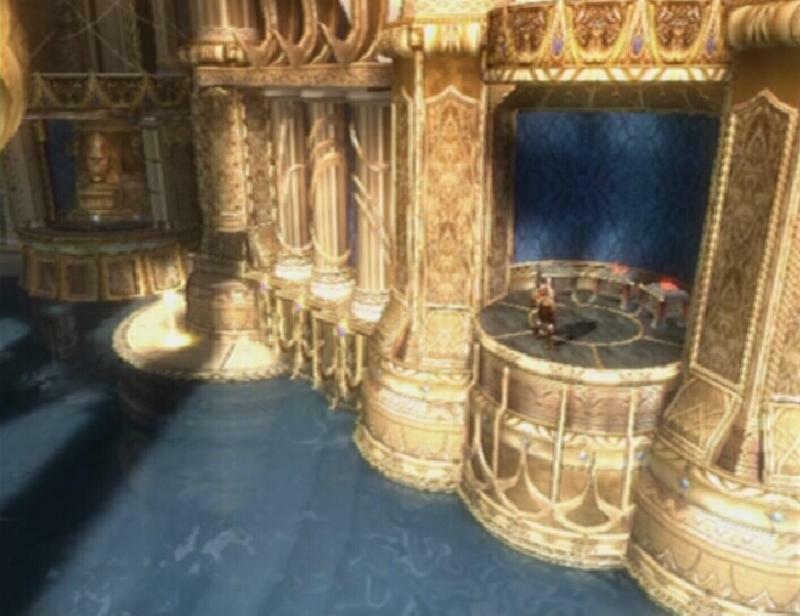 After killing the Sirens, head to the right side of this room and hop onto one of the two platforms on either side of the giant chain. From the platform, jump onto the chain and start running up the chain. 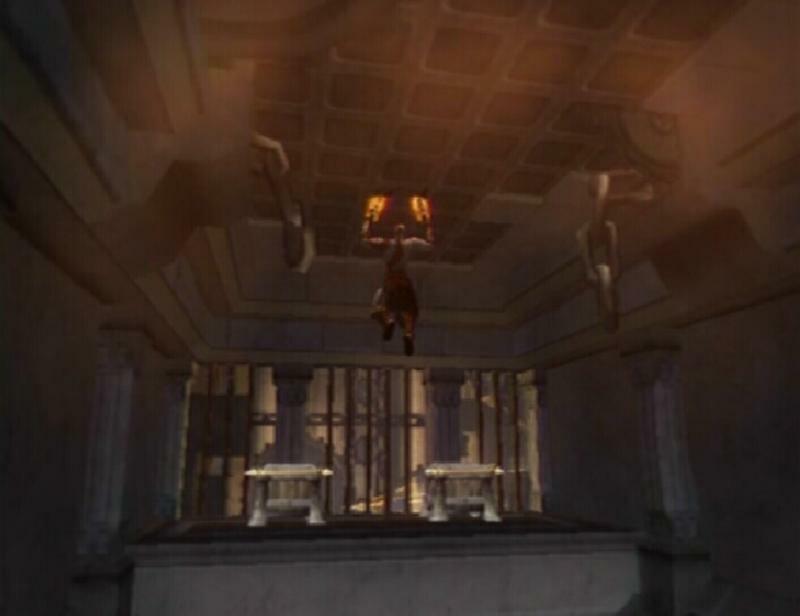 At the top of the chain, attach yourself to the ceiling and sling across to the chests across the way. Destroy the hanging chain in your path and drop down onto the platform that contains the two unmarked chests. The Gorgon Eye is in the chest on the left. 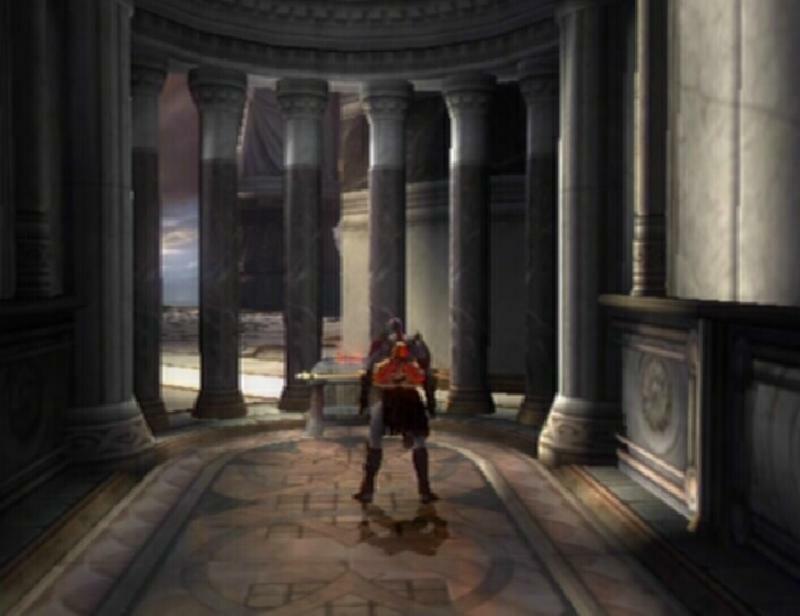 GORGON EYE (8/37): After the battle with Theseus, move to the right side of the platform you battled Theseus on and climb down the wall. The Gorgon Eye is inside of the unmarked chest on the right. GORGON EYE (9/37): When you reach the platform with the coloured switches, turn left, walk across the strap and scale the climbable wall. Walk towards the green totem, then turn right and drop down the series of ledges across from the totem. 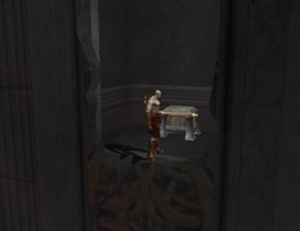 The unmarked chest containing the Gorgon Eye is at the bottom of these ledges. 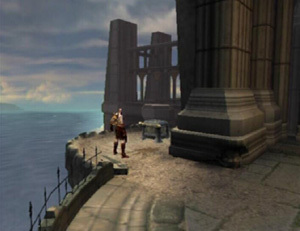 GORGON EYE (10/37): Near the beginning of the level, after you have climbed the waterfall, move straight across the wall, over the gap, and onto a stone balcony. Move to the other end of the balcony to find an unmarked chest. The Gorgon Eye is inside of this chest. GORGON EYE (11/37): Once you have entered the room with the large statue, drop down from the bridge up ahead. 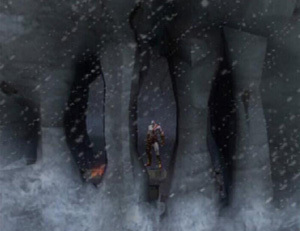 On the bottom level, turn around and walk under the platform. The Gorgon Eye is inside of the unmarked chest on the left end of the dais. GORGON EYE (13/37): After breaking the statue head off, move through the hole created. 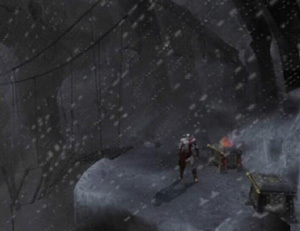 Kill the Wraiths and Bats that spawn outside, walk across the bridge, onto the walkway and turn right. The unmarked chest up here contains a Gorgon Eye. GORGON EYE (14/37): Use Euryale's Key to open the gate on the left side of the temple. Step through the gate and turn right to find an unmarked chest. The Gorgon Eye is inside of this chest. GORGON EYE (15/37): This chest is found in the 'Ruins of the Forgotten, after destroying the large stalactite and using the grapple point to swing across the pit. Once back outside, climb up the ladder on the right side of the initial area. 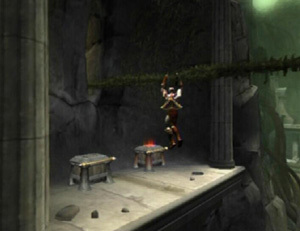 Move across the vine over to a platform that holds a Red Orb chest and an unmarked chest. The Gorgon Eye is inside of the unmarked chest. 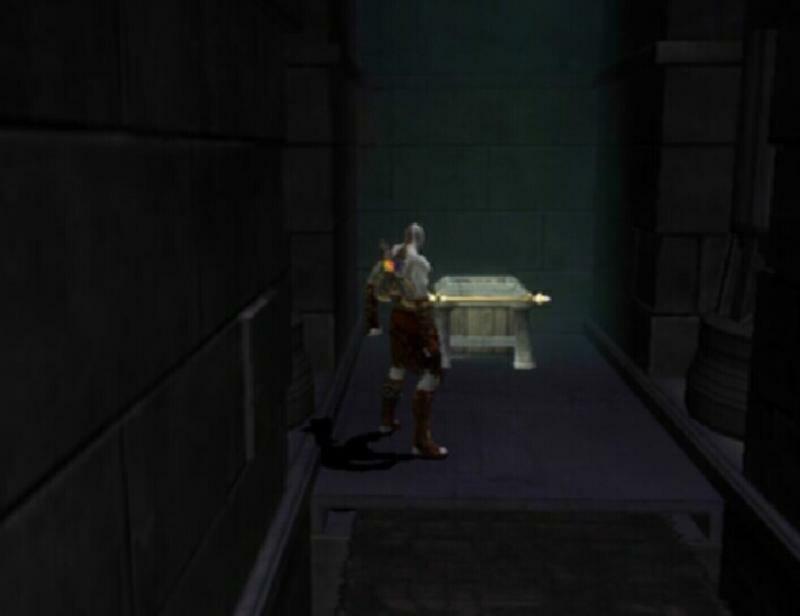 GORGON EYE (16/37): This chest is found in the circular room with the two buttons and water way. Stand on the button in the middle of this room, look up to the right of the gate to see a small alcove with two chests in it. With Typhon's Bane equipped, hold R2 to aim at the vines and shoot them until they are removed. Doing so reveals a grapple point. Use the grapple point to pull yourself up to the alcove. The Gorgon Eye is in the unmarked chest on the left. GORGON EYE (17/37): This chest can be found once you have used the wounded soldiers body to jam the gears. Once the gears have stopped, return to the large gear that you saw at the beginning of this area. Smash the stationary gear to reveal an unmarked chest. The Gorgon Eye is inside of this chest. 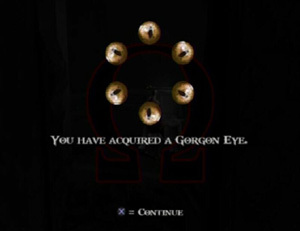 GORGON EYE (18/37): This Gorgon Eye can only be obtained once you have acquired the Golden Fleece from Cerberus. Return to the area with the conveyor belt and Gorgon beams and use Golden Fleece on the last beam along the belt. 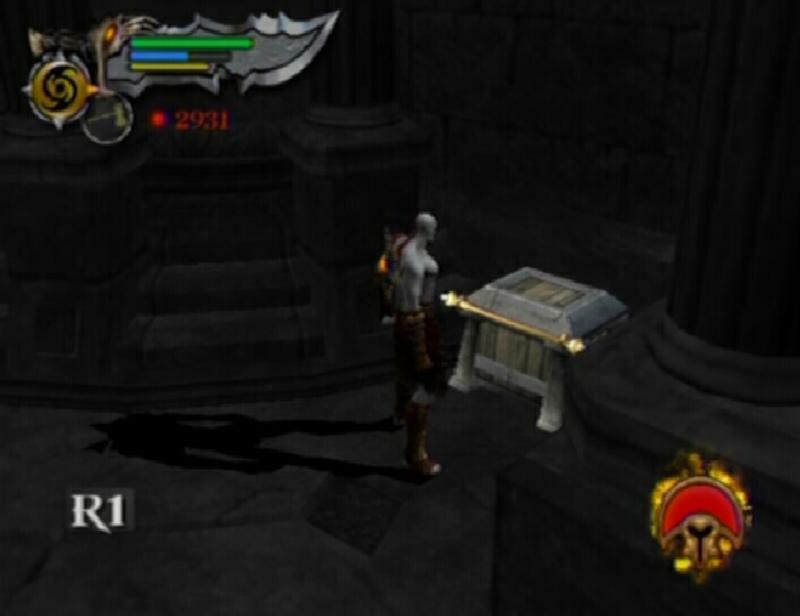 The unmarked chest that is revealed contains the Gorgon Eye. GORGON EYE (19/37): In the room with the two lifts that influence each other, raise the lift that you used to reach this room as high up as you possibly can while still allowing you to drop down from the lift to the room below. With the first lift positioned as described, look for a small alcove on the side of the lift. The Gorgon Eye is inside of the chest. 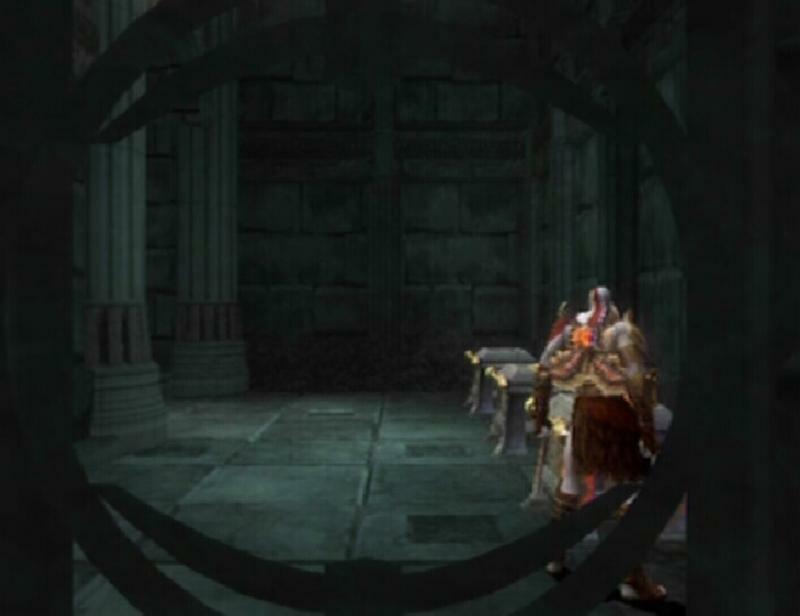 GORGON EYE (20/37): After defeating Euryale, you will come to a large area with several columns. When you reach the third column to be raised, destroy the broken door behind its handle. The unmarked chest within contains a Gorgon Eye. GORGON EYE (21/37): Once you have reached Destiny's Atrium again, go past the save altar beyond the large gate to the Bog of the Forgotten. In the Bog, follow the main trail to two chests. The chest on the right contains the Gorgon Eye. GORGON EYE (22/37): Found in the 'Catacombs of the Fallen.' 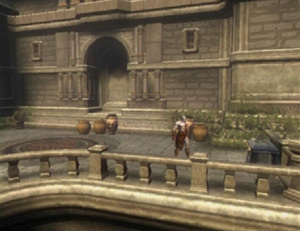 After facing the Elite Legionnaires and Undead Archers and outside, swing across the grapple point to the first platform. 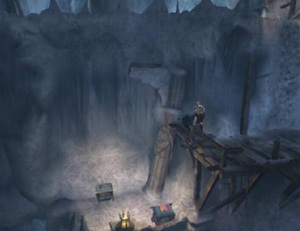 Scale the climbable wall to find two chests. The Gorgon Eye is inside of the unmarked chest here. GORGON EYE (23/37): After using the two pillars to climb up the left, you will find yourself back outside. Keep an eye on the right for some stairs leading downwards. Kill the Satyrs that appear downstairs. Afterwards, pull the block covering the doorway into the room. When you can't pull it any further, jump up onto the block and then onto the platform above the doorway. The Gorgon Eye is inside of the chest. GORGON EYE (24/37): This chest can be found in the 'Edge of Creation' area after obtaining the Spear of Destiny. Drag the Fates Statue in the bottom right corner of this area onto the disc surrounding the handle. 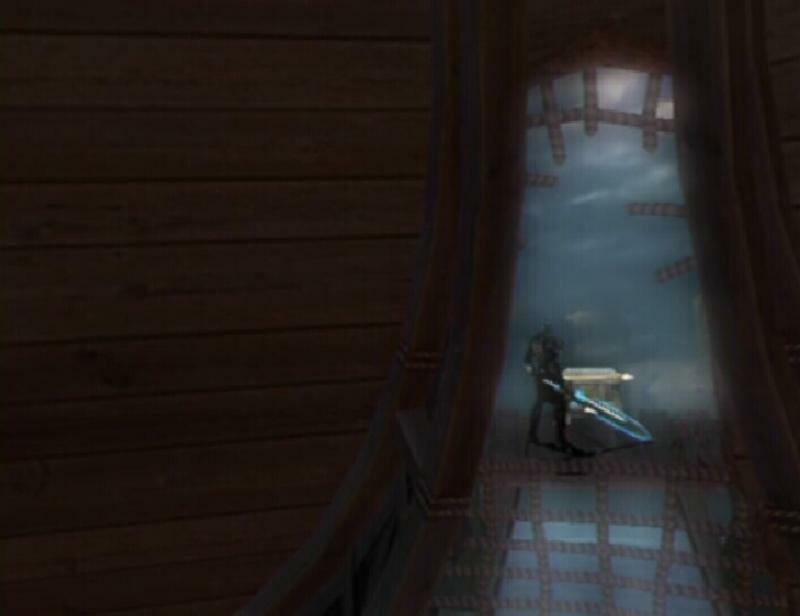 Grab hold of the handle and rotate the disc until the Fates Statue is facing the doorway. 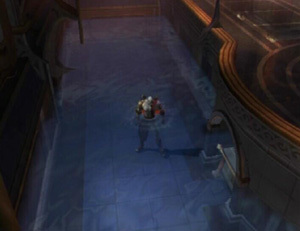 Next, drag the Fates Statue through the doorway, kick it down the ramp and drag it over to the pool of water. Swim over to the opposite side of the pool. 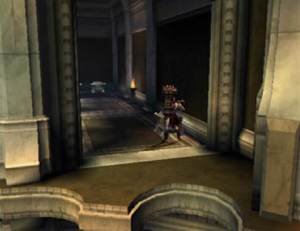 Turn around and walk as far back as you can (the Fates Statue is not on the screen), turn to where the Fates Statue is and activate the Amulet of the Fates. Use the grapple point to swing across the pool of water and then turn left around the corner. 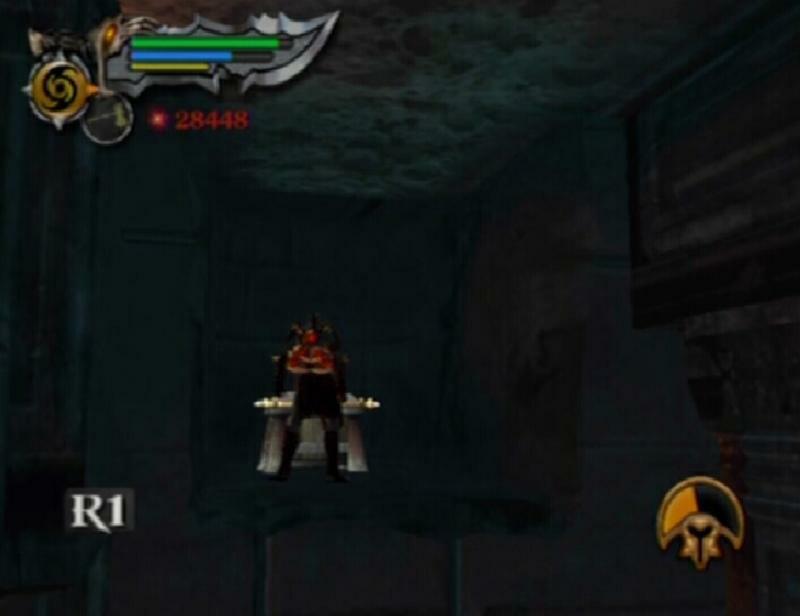 With the Amulet activated, you are free to move across to the chest without bringing the gate down. The Gorgon Eye is in the chest on the right. GORGON EYE (25/37): Shortly after fighting the Rock Minotaur, you will reach a room with a large boulder. Destroying this boulder reveals a steam vent that can be used to reach the high ledge across the depression. In this room, drop down from the ledge and into the depression below. Attack the wall in the top right corner of the depression to reveal a chest. The Gorgon Eye is inside of this chest. GORGON EYE (26/37): In the 'Ascension of Atlas' area, after the save altar, you will eventually reach an area with two boulders. Push the boulder nearest to the ramp up to the top of the ramp. Place the second boulder next to the ramp, below the first one. Get up the top of the ramp and push the boulder onto the boulder below it. Push the stacked boulders over to the ledge. Jump up onto the ledge and drag the top boulder away from the bottom boulder. Place this boulder underneath the climbable wall above. Stand on top of the boulder and glide over to the high ledge. From the ledge, glide over to the climbable wall. Move across the wall to a small platform. 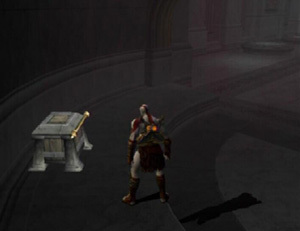 The chest on this platform contains the Gorgon Eye. Stand on top of the boulder and glide over to the high ledge. From the ledge, glide over to the climbable wall. Move across the wall to a small platform. The chest on this platform contains the Gorgon Eye. GORGON EYE (27/37): This chest is found once you have returned to the Great Chasm. 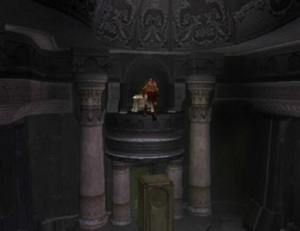 On the platform with the save altar, turn left and jump to the climbable wall. Climb up to the top of the wall. The chest up here contains the Gorgon Eye. GORGON EYE (28/37): Upon entering the 'Garden of the Gods' area, destroy the cracked wall on the left and proceed through the opening that is created. 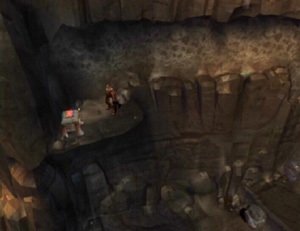 Glide over to the narrow ledge that runs along the wall. 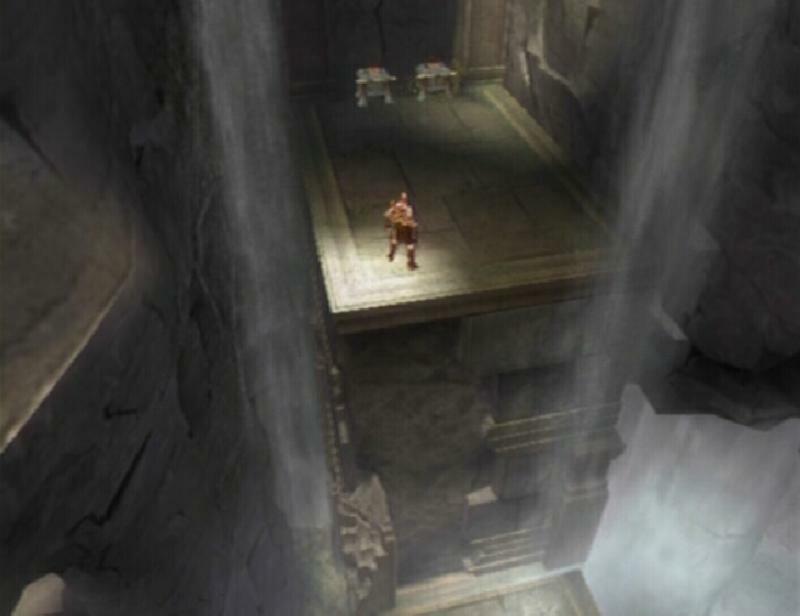 As you move along the ledge, after passing under the first arch, drop down to the small area that is visible below and climb up the ladder there. 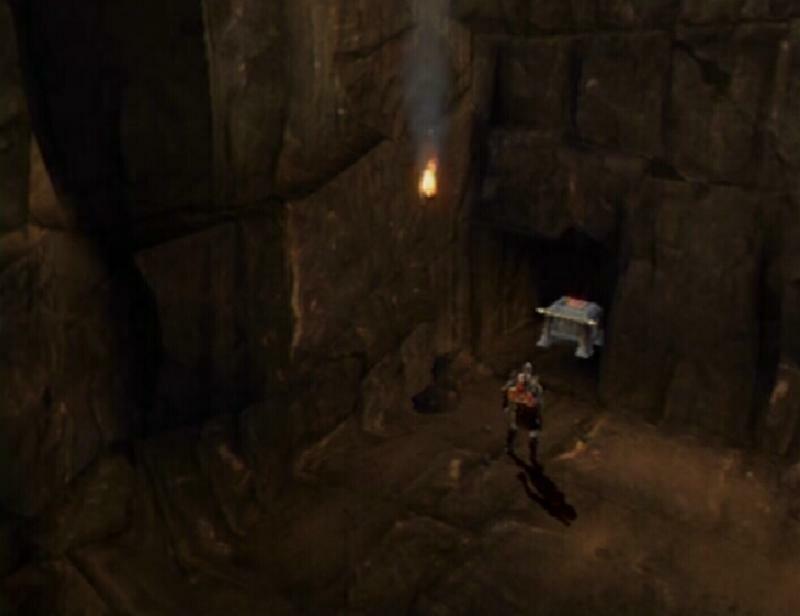 Head left to reach a Red Orb chest and an unmarked chest. Open the unmarked chest to obtain the Gorgon Eye. GORGON EYE (29/37): After fighting the two (or more) Cerberus and Juggernaughts towards the gate and climb up the ladder on the left wall. 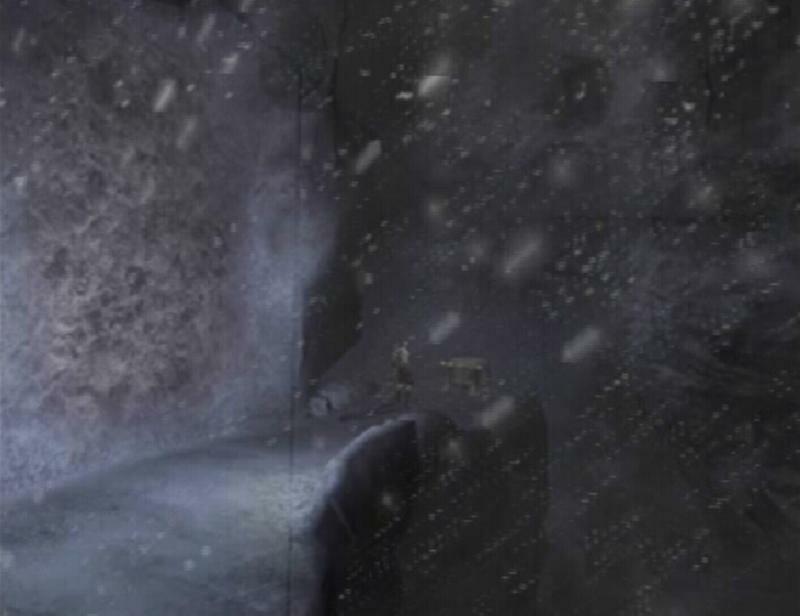 At the top of the ladder, turn around and glide over to the ledge on the other side. Open the chest to obtain a Gorgon Eye. GORGON EYE (30/37): In the underground, you eventually reach an area with a rope that will break when you are halfway across. 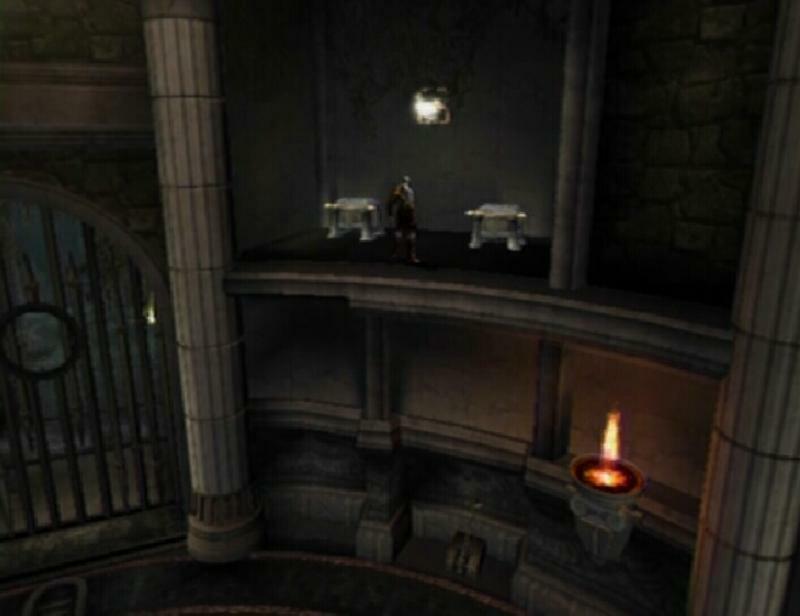 Kill the Archers that spawn on the platform to the right, then drop back down to the lower platform and use the climbable wall to reach the ceiling. Once on the ceiling, move around the wall you just climbed and turn left into the small area there. Turn left again to discover a small indent containing the chest. GORGON EYE (31/37): This chest is found shortly after the Gorgon Eye described above. You will soon come to another steam vent, initially covered by a large boulder. Equip Typhon's Bane, hold the R2 button to aim at the symbol on the wall behind the steam and press Square to shoot the symbol. Do this until it is destroyed, revealing a secret area. Strike the wall on the right to uncover a hidden lever, use this lever to manipulate the pillars in the next area. This next part is a bit tricky. 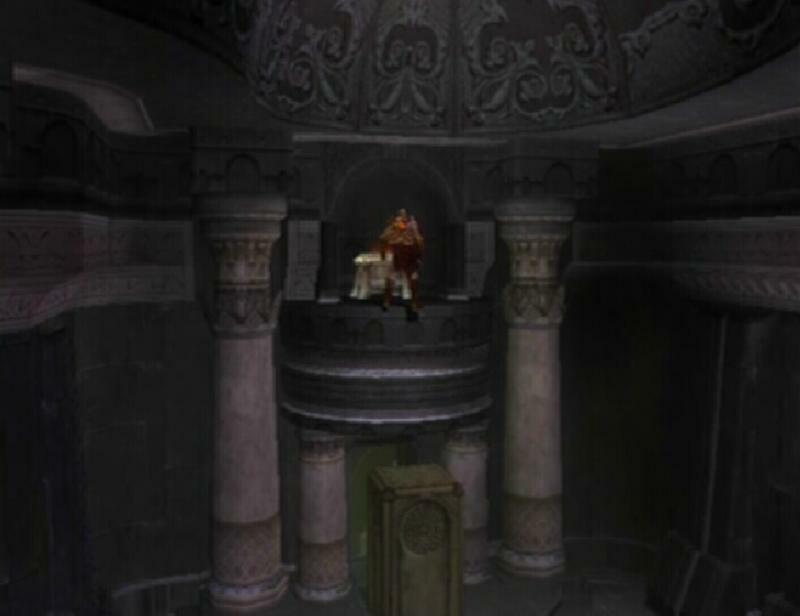 Stand on the ledge and glide to the right, use the steam near the second pillar to rise up into the air. Glide to the small ledge on the right. The Gorgon Eye is in the chest here. GORGON EYE (32/37): Once you are through the spike room, start down the hallway. When you reach the wall with lava running down it, hug the wall on the right. Jump and grab hold of the ledge that is visible on this wall. 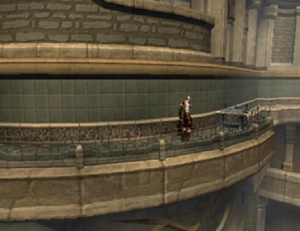 While hanging from this ledge, push down on the Left Analog Stick and press the X button to jump over and grab hold of the ledge on the opposite wall. 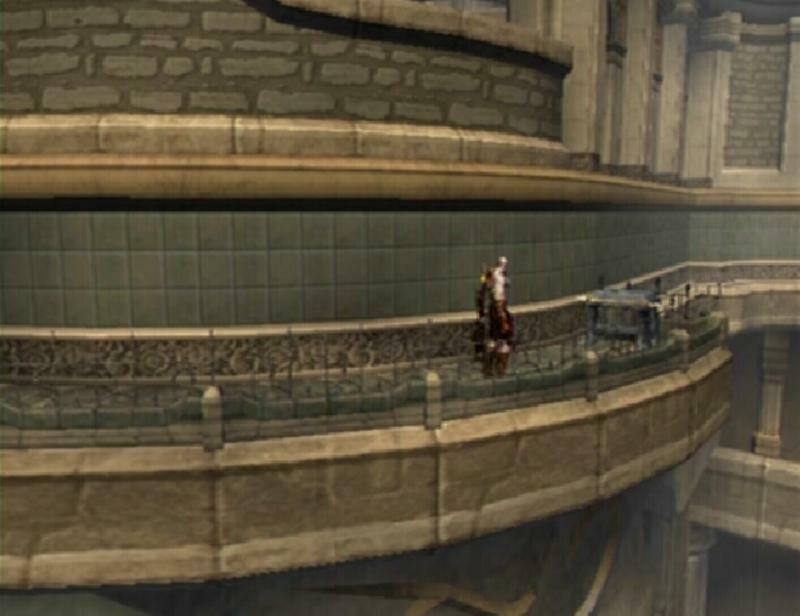 Pull yourself up and go through the ledge. 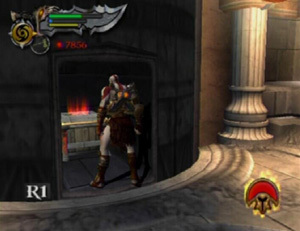 Drop down to the area below to find two Red Orb chests and one chest containing the Gorgon Eye. GORGON EYE (33/37): When you reach the 'Auditorium of Lahkesis' area and use the Hail of Boreas to open the door, start down the hallway and follow it all the way to the left, past the hanging chain, to find the chest in front of some pillars. GORGON EYE (34/37): Once you reach the Phoenix's platform, open the chest to the right of the Phoenix. 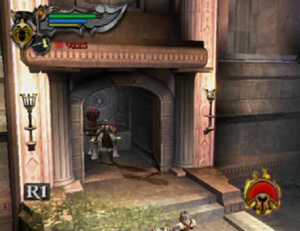 GORGON EYE (35/37): In the initial area, after smashing the statue head, use the handle on the platform's base to turn the ram towards the bottom-left corner of the screen. When the platform is positioned correctly, immediately activate the Amulet of the Fates. Get onto the platform and jump across to the ram. 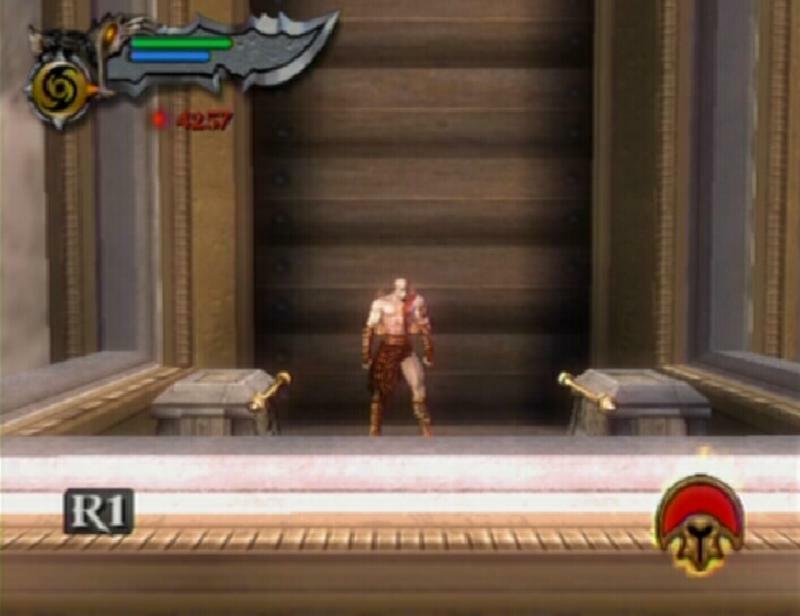 Run to the end of the ram and then glide across to the platform that contains the chest. GORGON EYE (36/37): Once you reach the 'Inner Sanctum' area, standing near the save altar, turn left and drop into the water. 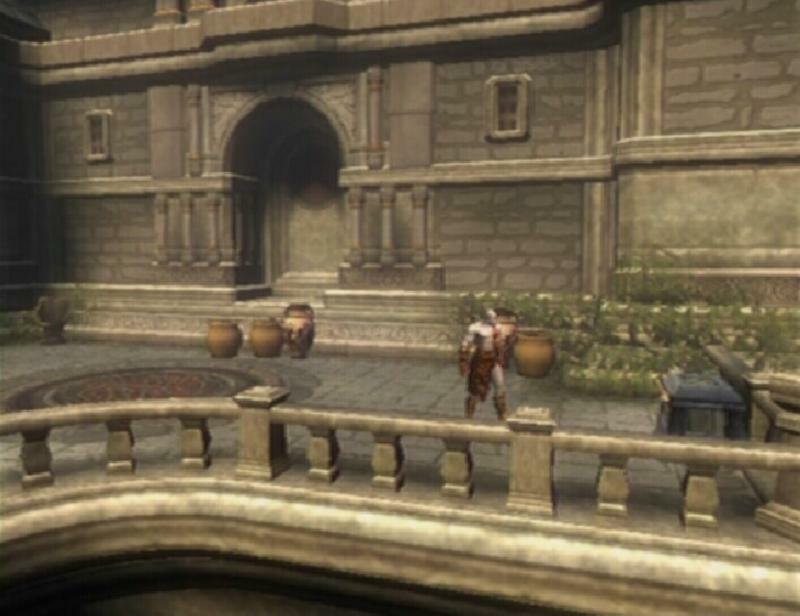 Look for the chest in an alcove on the side of the platform. GORGON EYE (37/37): This chest is found in the first room beyond the 'Inner Sanctum' save altar. Sling along the ceiling and drop down onto the platform on the opposite end of the room. 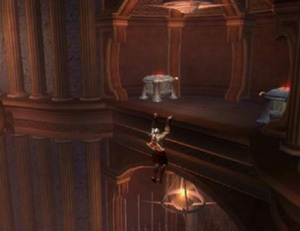 Leap off of this platform from the right side and use the Icarus Wings to glide over to the high alcove along the wall. Grab hold of the ledge and climb up. One of the chests here contains the Gorgon Eye. This guide is copyright 2007 SuperCheats.com, no part of it may be reproduced without permission. Super Cheats is an unoffocial resource with submissions provided by members of the public. These are not usually tested by us (becase there are so many), so please use them at your own risk.